The Wolf of Wall Street Part 1 « ENTowner Build a Legacy, Inc.
After watching The Wolf of Wall Street, living through Enron, and the Madoff Scandal, it’s apparent that every investor needs to know a little something about how well the companies they are putting their hard-earned dollars into are doing, and the company the brokers are employed with. It’s quite easy to get lost in the numbers, acronyms, and financial jargon. However, as events from the past prove, it’s more important than ever to understand the lingo and how these terms help investors understand the way companies make money in their respective genre. Financial analysts use tools to determine whether or not a company is a good investment. These are terms you should pay attention to when speaking with your financial planner/advisor: Earnings Per Share (EPS), Return on Equity (ROE), and the Efficiency Ratio. Now don’t get me wrong, I’m not saying that you need to learn the job of your broker, financial planner/analyst, so that you can bypass them, they are our eyes and ears on the stock market. What I’m saying is, do not leave your nest-egg unguarded, and they are human (prone to make mistakes). So, know what the terms mean and how they are calculated so you are not in the dark about how your money is being managed. Remember, financial analysts work for you, but they also work for their employer. So, when you sit down with your Investment Banker/financial analyst/broker, make sure to have a copy of your portfolio, and have them explain why they think your current investments should remain as they are. 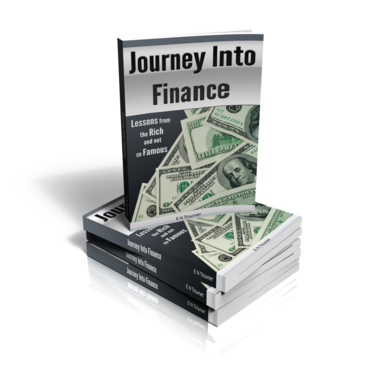 Include the key terms mentioned above and in my book (Journey Into Finance), have a writing pad with you and jot down notes as you go along. You’ll be surprised at how they spill their guts, trying to impress you. Not only that, you can see how sincere and committed they are to your portfolio. So, over the next few weeks, I’d like for you to read over a prospectus, and set up an appointment with your banker for about an hour. Have them explain how well each stock is doing. Before leaving that meeting, set up another appointment in a month, to see what progress the portfolio has made. In the meantime, look over your finances, and see where you can make some adjustments with your spending, to invest it in your future goals (retirement, a trip to Disney World, that luxury vacation, etc). Pick up a news paper and look at the financial section, familiarize yourself with the DJIA and NYSE. Pay close attention to the EPS. In part 2, we will discuss Return on Equity (ROE) . Please be sure to let me know how your meeting turned out. P.S.- My daughter wants to take acting classes. I’ll let you know how I plan on paying for that huge investment. Live your dreams. This entry was posted in Blog and tagged analysts, bankers, finance, financial plan, financial planners, insider tips, investing, plan, portfolio, wealth.